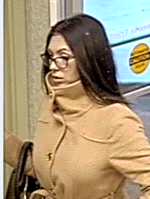 The Ottawa Police Service Organized Fraud Unit and Crime Stoppers are seeking the public’s assistance in identifying a suspect in fraud of over $10,000. On the 15th of January 2019, the woman in the photos below attended a bank with identification in the name of one of their customers and was able to access more than $10,000 from the victim’s account. Please see the photos below provided by investigators.